Posted byJoelRieves	 May 2, 2016 Leave a comment on What Does “Alice in Wonderland” Have to Do With HB 2? Last year, in a moment of what can only be called “insanity”, I decided that continuing my education would be a nice thing to do with all the time on my hands since retiring. While it has been…, let’s say, challenging, at some points, at others, it has been incredibly interesting. Take, for instance, the banned book essay I’ve been working on the last couple of days. I mean, who knew “Alice in Wonderland” had ever been banned? And, the reasons? Oh, you wouldn’t believe some of the reasons. Like the one I’m going to tell you about today. It seems that, in 1900, Woodville High School in Haverhill, New Hampshire “suspended” Lewis Carroll’s “Alice’s Adventures in Wonderland” from classroom use. That’s what the sources say, not banned, but “suspended from classroom use” (not sure what the difference is, but it’s very specific about that). Why did they do this? Because they claimed it contained “expletives,sexual content and derogatory characterizations of a teachers and of religious ceremonies”. Well, okay then. If you’re like me, you’re wondering “Where might these sexual references be found? In the caucus race? The Tea party? Maybe they’re in the Mock Turtle’s story or the Knave of Heart’s trial.” Who knows? Before you start looking for your copy of “Alice” to see if these accusations are true, let me save you the trouble: they are not. I just finished it a couple of weeks ago and I can’t think of anything even remotely sexual in the entire book. Documentation for Woodsville’s claims is, evidently, lost to posterity; that’s if it even existed in the first place. One of my librarian friends (fyi, you know you’re a nerd if you have more than one friend who’s a librarian. I have two…, that I know of) told me that, quite often, the reasons books are banned hasn’t always been made clear or even given; at least not in writing, anyway. So, we are left with this odd little blurb that casts a less-than-wholesome light on one of the most beloved children’s books of all time. Weird, huh? Okay, I know that was a lot of background, but I had tell you all that so I could tell you this: Banning “Alice’s Adventures in Wonderland” for non-existent “expletives and sexual content” makes about as much sense as forcing trans people into bathrooms where they’re likely to be harassed because you’re afraid of mythical bathroom predators. 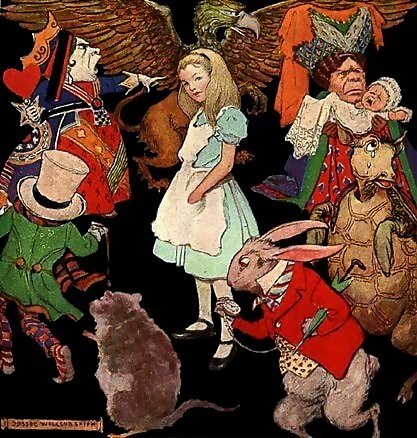 Just as I have to wonder what kind of mind can find sexual references in “Alice”, I also have to wonder what kind of mind can justify discriminating against people because they’re a minority, or they’re different, or they’re “scary”, or whatever, all in the name of protecting women and children from a non-existent threat. Especially when that means means exposing someone else’s children to a very real one. That so many people who support HB 2 (and other similar laws) claim the name of “Christian” blows my mind. How the hell can you claim to follow a man who hung out with hookers, lepers and tax collectors and told his followers to love everyone and then turn around and dump on the most marginalized people in society (duh, trans folks) with laws that push them even further to margins? If you don’t think this kind of thing makes Jesus cry, you don’t know Jesus. At all.